An apse at the Canopus, Hadrian’s Villa. Not my photo. Mine’s still on my camera. Today I visited Hadrian’s ‘Villa’ near Tivoli — an easily bussable distance from Rome. As I walked around, one of the many thoughts that struck me was the similarities between Roman architecture and early Christian architecture — the architecture of the West to the end of Romanesque (which simply became Renaissance in Italy, consciously looking for classical models) and the East for a lot longer. It is my contention that these architectural styles are not borrowed from ancient ‘pagan’ cult but from domestic, public, and commercial architecture first and foremost. Ancient Christians were very wary of their polytheist neighbours, their spaces, and their cultic practices well beyond Constantine (contrary to what some people will try to tell you). To return to Hadrian’s Villa, then. Many rooms and buildings at Hadrian’s Villa come fully equipped with apses — semi-cylindrical ends of rooms with semi-domes at their tops. The apse is a common feature of most churches within a certain period. It persists into the Gothic and beyond. Sant’Agnese, a seventh-century basilica in Rome, has a nice apse. 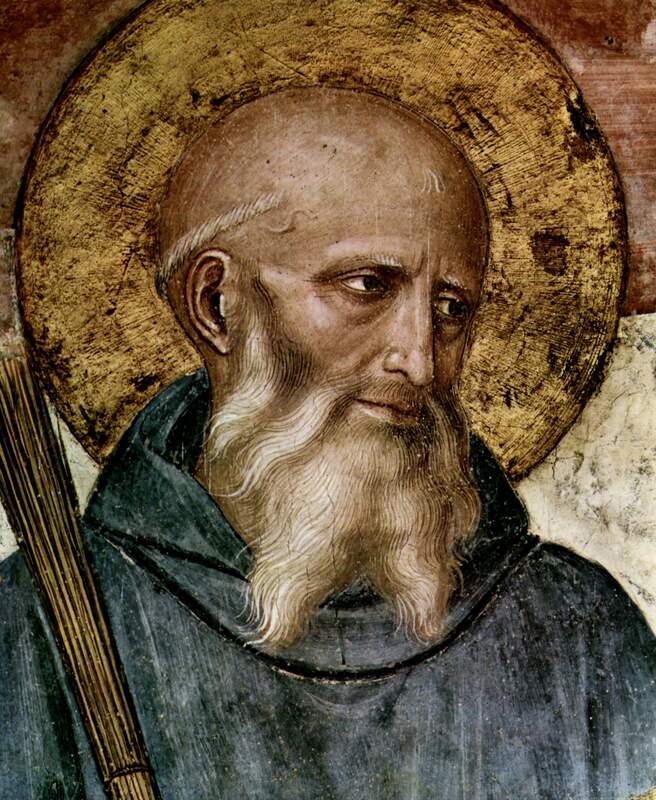 And that word — basilica. This is a Roman word, and not one related to religio. In contemporary church-building lingo, it refers to a Roman Catholilc church that has been all blessed up by the Pope. In ancient Rome, it referred to a large, covered building used for conducted business, originally based on a building seen by M Porcius Cato the Elder whilst abroad called a basilike — a royal building. The basilica was a lawcourt and place of commerce and enterprise, not a temple. Also, it had an apse where the magistrates would sit to listen to people’s entreaties. This, in fact, is not unlike the original function of a Christian apse, where the bishop would sit in the middle flanked by his presbyters — today, you are likely only to see a painting of concelebrating bishops. 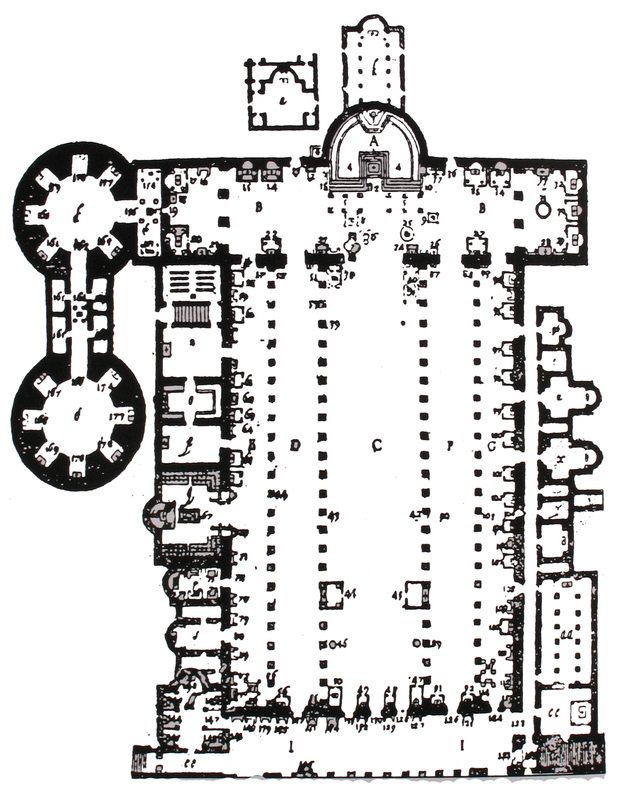 Besides having an apse, the floor plan of a basilica, such as the fourth-century Basilica of Maxentius, Rome, demonstrates the indebtedness of the Christian basilica to its secular forebear. In the fourth century, Christians begin building churches in the form of basilicas, apses and all. 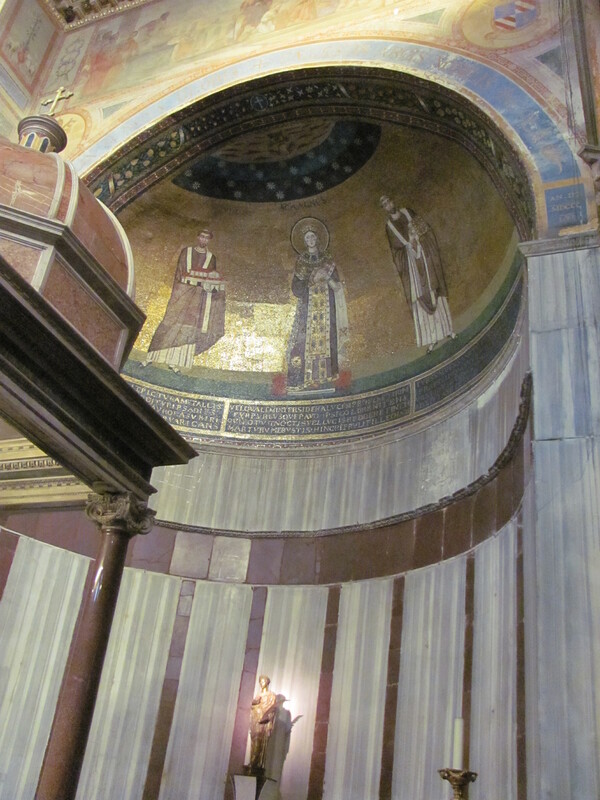 The earliest, Basilica Constantiana, is now San Giovanni in Laterano — technically Rome’s cathedral. I’ve not visited it, but it was built in the fourth century under Constantine; much of that early architecture, I understand, is obscured by its mediaeval redecorating. The other major Roman basilica of the period is Old St Peter’s, remains of which are visible beneath — you guessed it — St Peter’s. * These Roman basilicas set the stage for centuries of basilica building to come. Why do Christians adopt this form? Why do they take on this and many other features of ancient Roman architecture — columns and round arches and domes and niches for statues and on and on? Is it that wicked heresy of ‘Constantinianism’ destroying the pure churches that once met in houses? Well, given the frescoes at Dura Europos and the Catacombs, as well as the sheer size of some of these ‘house’ churches, I do not think that they went reluctantly to basilicas. The basilica was adopted because it is eminently practical. It is suited to Christian liturgical functions — basically as we know them since at least the late first century. The apse, besides any practical function, helps set out that side of the building as a focus. Adding a mosaic only helps — as with all the other embellishments, such as fancy capitals. 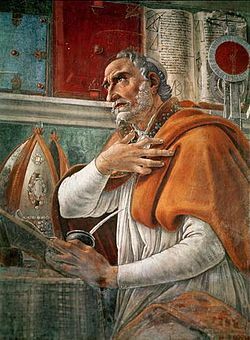 Just as Augustine put his secular rhetorical training into Christian service, so the architects of the age put their secular architectural training into Christian service. *Maybe Constantinian, maybe Constantian. I have no dog in that fight. A friend of mine is a minister at a church with a very multicultural, international congregation. One day, of the many Africans in his congregation came to him and offered to pay him so that he would put a curse on someone for him. His answer was a firm no. This is the sort of startling story we hear coming out of Africa more frequently than most of us are very comfortable with. But if the Global South is becoming the new Christendom, as Philip Jenkins argues in The Next Christendom, then ought it not to have all the characteristics of the old Christendom? When I first mentioned the Christianisation of Europe here, it was in the context of the persistence of pagan practices throughout the Middle Ages, after Europe was an ostensibly “Christian” continent. The ongoing resort to non- and pre-Christian practices by believers go back to the sixth century under Justinian, if not earlier. Letter 753:Question: Since my beast of burden is ill, it’s not out of place for someone to cast a spell on it, is it? Answer: The casting of spells forbidden by God, and it is not necessary to make use of it all, for it is destruction of the soul to transgress the command of God. Apply to it, rather, the treatments and cures of veterinarians,* for this is not a sin. Pour over it holy water as well. 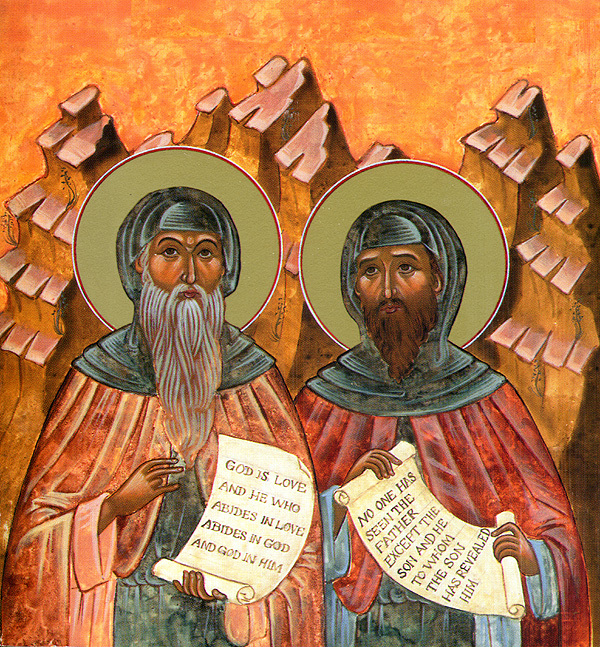 Given that the person addressed the letter to the Two Old Men of Gaza, he was probably well associated with the church (although we cannot forget the social function of the holy man in Late Antiquity). We cannot assess this person’s level of Christian commitment. This person could be head-over-heels for Christ and attend Church assiduously. However, how many sermons about spell-casting do you really ever here? And how well catechised is the growing Christian population of the Eastern Roman Empire in the sixth century? What this letter illustrates is the continuation of apparently “pagan” practices in the Christian Empire on the part of Christians. It also demonstrates the difficulties attendant on catechising the many Christians of Justinian’s Empire. It also casts away the easy distinction between “Pagans” and “Christians” as we observe the historical record. Finally, it brings home the importance of helping Christians learn accurate Christian faith and practice so they don’t go around casting spells on sick beasts of burden.